tickets to go to Legoland! So the first weekend in May of 1999, we got to go to my brother's all-time favorite place. Now I don't know how he decided to make this his favorite place since he'd never been there before, but he said it, so I believe it. Anyway, here's the story of our trip to Legoland. Legoland is about a hour and a half south of us in Carlsbad, California. It opened on March 20th of this year to great fanfare, and rightly so. It's a great place to take kids under the age of 11. I don't think many kids over 11 will enjoy it as much as my brother, sister and I did because there aren't many fast rides. But, there are a lot of very cool things to do and see. The first thing we did was go look at Miniland. Miniland is a place that has small scale replicas of great American cities. There were cars driving through the streets of all of these cities. The cars traveled by way of electromagnets under the streets. There are almost 200 miles of wiring in Miniland, just to make all of the cars, boats, trains and parades move around the place. I got to see a Mardi Gras parade in a miniature New Orleans plus a scale replica of Washington D.C. including the White House. I heard someone say they could see the President in the upstairs window, but I had no idea what they meant by that. I just thought the models were really cool. New York City was awesome. It looked so real I thought I was in Times Square! 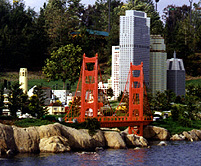 There was also a model of San Francisco including the Golden Gate Bridge. I've never seen the bridge, but apparently, it looks very real. All of the models in Miniland are scaled down to 1/20th scale. I would have looked like a giant in there, but they had fences to keep people out. This was one of those "look but don't touch places." After we got through looking at Miniland, it was time to go on some rides. I got to go on a jousting horse ride. It was a lot of fun riding around on the horse pretending I was in a jousting tournament. The knight who I jousted with at the end of the ride had all sorts of excuses as to why he didn't win, but the real reason was I was such a great horseback rider. Another place we went to was a gigantic jungle gym, complete with rope ladders, suspension bridges and tube slides. I think I climbed the slides several million times - well maybe 10 times or so but it felt like a million. I think I would have enjoyed playing in the jungle gym all day long, but my brother wanted to do some other stuff so off we went to the motor boat ride. The motor boat ride was fun. The boats aren't on any kind of track which means you get to drive them. I went with Daddy on this ride and decided to drive our boat. Needless to say, we took the scenic route around the course until I got tired of driving and let Daddy have a turn. After he started driving, we didn't bump into anything else. He's a very good driver. My brother wanted to drive the cars. These are a little bit different than at Disneyland too, because they aren't on any track either. You had to be six years old to drive on those, so I watched while he drove his car around the track very carefully. They had stop signs and signal lights there and you were expected to obey all of the traffic rules. He really enjoyed himself and got a Legoland Driver's License. Daddy scanned a picture of him driving the car and printed it out for his license. It looks very official. At the top of the hill in Legoland is a maze. You get to run through it as many times as you want. There is an observation tower that lets you get up high to see the whole maze. Even so, I think I got lost a couple of times and ran into a couple of dead ends. There were a couple of places that had water shooting up from the ground. I thought this was pretty neat. In fact it was very cool when the water squirted up and almost wet my pants. I got through in time, but my brother had to stop so he wouldn't run into the water. He liked to kick the water and splash me with it which was also great fun. Another really cool place was the Duplo play area. They had big huge Duplo blocks to climb on and crawl through. There was some very fun water thingies that you could stand on and send showers of water all around you or at other things. You could have musical instruments made out of Legos play all sorts of tunes while water squirted out of the top of them. My sister liked playing with the fountain that shot water out of a seal's nose and almost hit you with the water. She had to take her glasses off so they wouldn't get wet. The last thing we went on before we went home was this very cool boat ride. You got to ride around and see all sorts of very cool things made out of Legos. We saw the Opera house in Sydney, Australia, the Taj Mahal, the backside of New York City and Mt. Rushmore. Mt. Rushmore looked very real until you got up close to it. Then you could see it was made out of Legos. 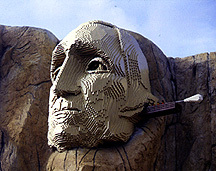 They also had a Lego maintenance crew cleaning out George Washington's ear with a Q-Tip made of of Legos! By the end of the day, my parents were exhausted. I have to admit, I was too, but I'd never tell them I was. I heard my mommy say that the next time she can get discount tickets, we'll go again. I can hardly wait!